Researchers from Eindhoven University of Technology have developed a microsensor that makes it possible to directly monitor and adjust the composition of kidney dialysis fluid. This is a crucial step towards patient specific dialysis, which will remove a significant proportion of the serious side effects of the use of standard dialysis fluid. On 29 March Manoj Kumar Sharma will be awarded a PhD for his research on this sensor. Kidney failure makes around two million people worldwide dependent on kidney dialysis to clean their blood. A tube is connected to a blood vessel and the blood is passed along a membrane, with dialysate (dialysis fluid) on the other side. Because the concentration of salts in the blood is higher than in the dialysate, salt passes through the membrane and enters the dialysate. The rate at which this happens depends on the difference in concentration between blood and dialysate. Since the concentration of salts varies widely among different patients, and the concentration in dialysate has the same standard value, the speed is often not ideal. This causes serious side effects, such as heart rhythm disturbance and renal bone disease. It would be better to continuously adjust the concentrations of salts in the dialysate so that they are optimal for the patient. This, however, requires that the concentrations of salts in the dialysate can be monitored live, but there had not been a reliable technique for that to date. Manoj Kumar Sharma has devised an ingenious solution for this. He developed a micro-system with a centrally positioned microchannel through which dialysate flows. He covered the walls of the microchannel with sensor molecules, which are only fluorescent in the presence of a salt, such as sodium. The more sodium there is in the dialysate, the stronger the fluorescence. To reinforce this effect, he introduced micropillars into the microchannel, resulting in even more surface covered with sensor molecules. A laser light shines on the microchannel, and activates the fluorescence of the sensor molecules. Sharma captures this fluorescence using glass fibers that he connected to the channel in the micro-system. The light passes through the fibers to a spectrometer for analysis. The laser light, which is of a different wavelength, is first filtered out. Then, based on the measured intensity of the fluorescence, the sodium concentrations can be read out. It is important to ensure that the sensor molecules are not disturbed by other salts, so that a pure measurement of the concentration of a specific salt is possible. The 'microfluidic sensor system' of approximately 5×2 centimeters built by the Eindhoven researcher is able to measure sodium, the most important salt in the blood, accurately and live. He expects that it will be relatively easy to extend the micro-system with channel sections coated with other 'photo-induced electron transfer' (PET) sensor molecules, which are sensitive to the other essential salts, such as potassium and phosphate. Sharma thinks that his technique has a very good chance of being used in dialysis machines. The technique is relatively cheap, stable and very accurate. In addition, he expects that the size of his sensor system can be further reduced, to about 1×1 centimeter, facilitating integration into dialysis machines. His technique may also eventually become part of a portable artificial kidney, a solution that will significantly ease the life of kidney patients. Sharma carried out his research in collaboration with Maastricht UMC + and TNO and with the support of the Dutch Kidney Foundation. 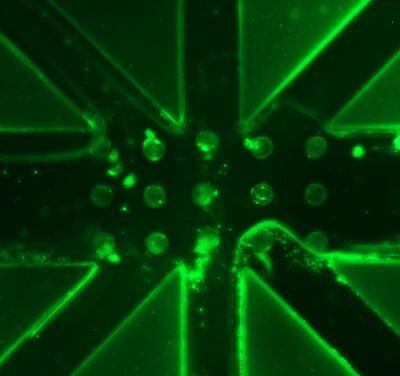 Microscope picture of the microfluidic device developed by Manoj Sharma. The horizontal stripe is the microchannel, which measures 0.2 mm across. The six other stripes are optic fibers that capture the fluourescent light and lead it to a spectrometer. The fifteen dots in the middle are micropillars.